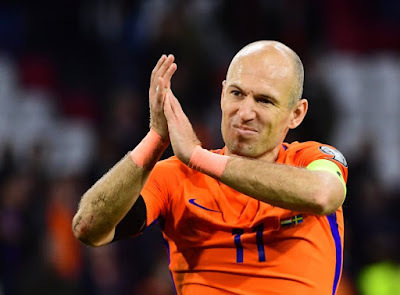 Bayern Munich forward, Arjen Robben, has announced his retirement from international football. Robben’s two goals last night against Sweden in a 2018 World Cup qualifier could not help Holland qualify for the showpiece. Holland is among popular countries that will be absent in Russia next year. The left-footed winger revealed his decision, after it was confirmed that the Dutch will not be at the tournament in Russia next year. He told reporters, “I want to focus on my club career now. The 33-year-old started playing for his senior national team in 2003 and scored 37 goals in 96 matches.